Hello everyone, and welcome to the blog! This is Astrid here with my second project for October. 1. Cut holly paper to 8 1/2 by 11", this will make the bag, I used the red side of the paper. 2. Score along the long side at 2, 5, 7 and 10", this leaves you with a 1" glue tab at the end. Turn paper 90 degrees and score at 2 and 7"
3. 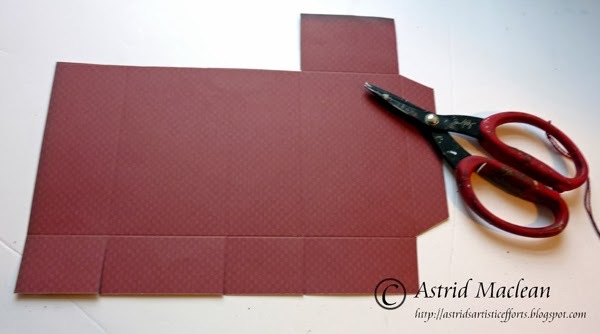 Put card horizontally at cut as shown, create a glue tab at the side by cutting at a diagonal and cut vertically at the bottom edge, this will form the base of your bag. Put aside until later. 4. 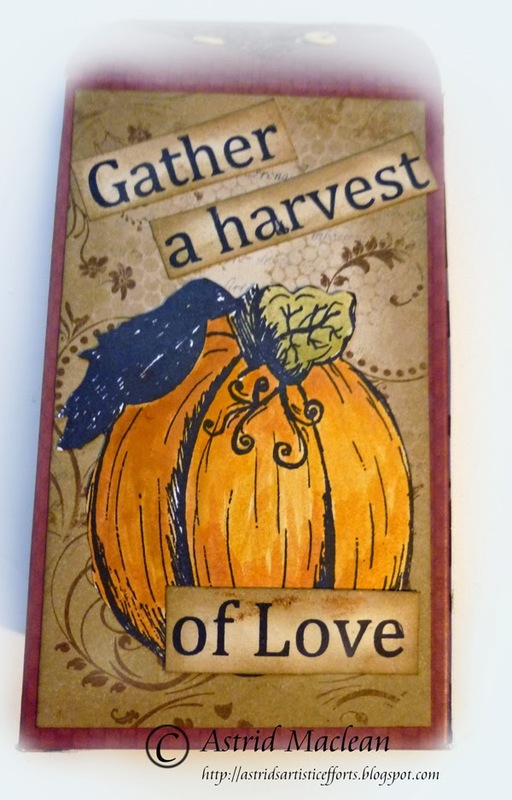 Cut 2 panels 2 3/4 by 4 3/4" from smooth white card stock, these will decorate the front and back of your gift bag. Decorate with various stamps from the Journaling 1 and 2 sets as shown. Ink around the edges with Antique Linen, Pumice Stone and Frayed Burlap Distress Inks. 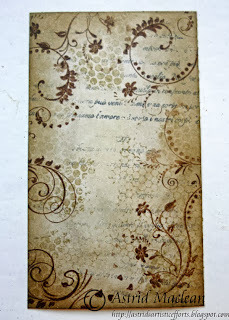 Stamping was done with Watering Can and Potting Soil Archival and Frayed Burlap Distress Ink. 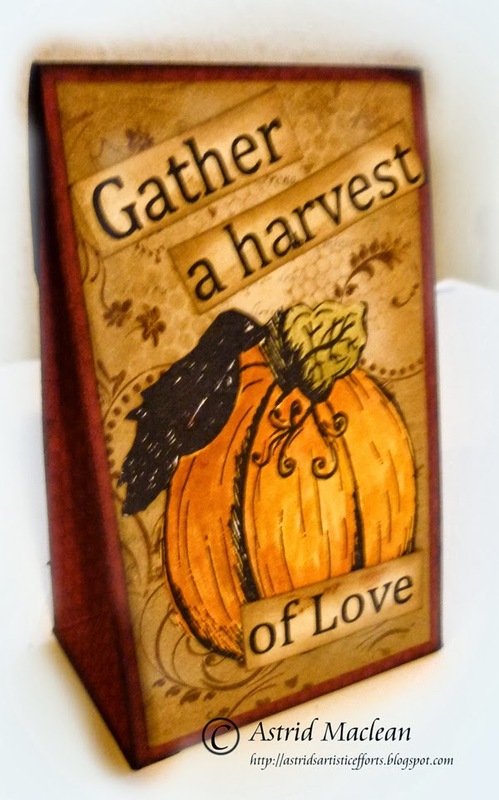 I decided to add more interest to the front panel by running it through an embossing folder along the side. 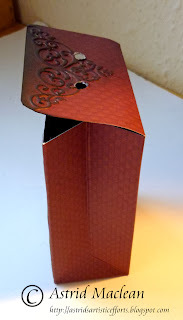 I also rounded the edges and embossed the flap of the actual bag. 5. 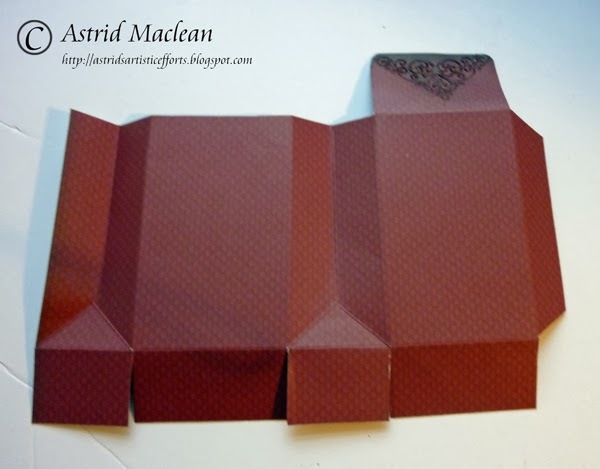 Create extra score lines as shown in the two bits that will form the sides of your bag, this will help folding it together later. 6. 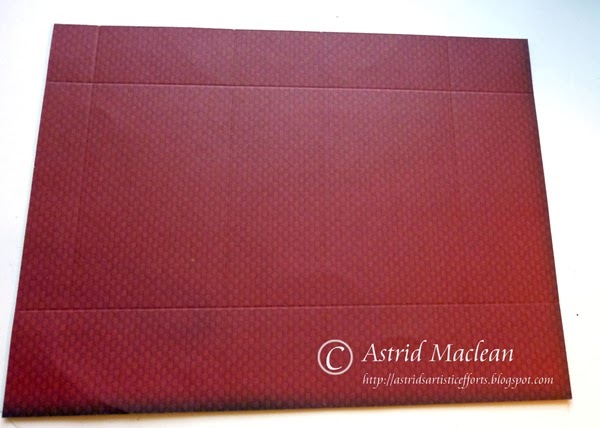 Adhere panels to your bag base, using your favourite adhesive. 7. 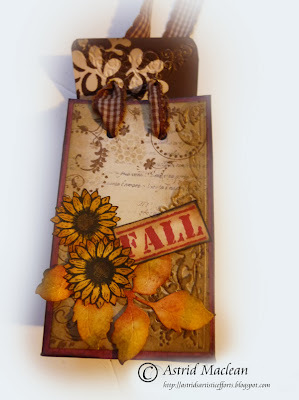 Before gluing your bag together, make holes in the flap and front panel to tie a ribbon through later. I set some eyelets for strength on the flap part. 8. Glue bag together as shown. 9. 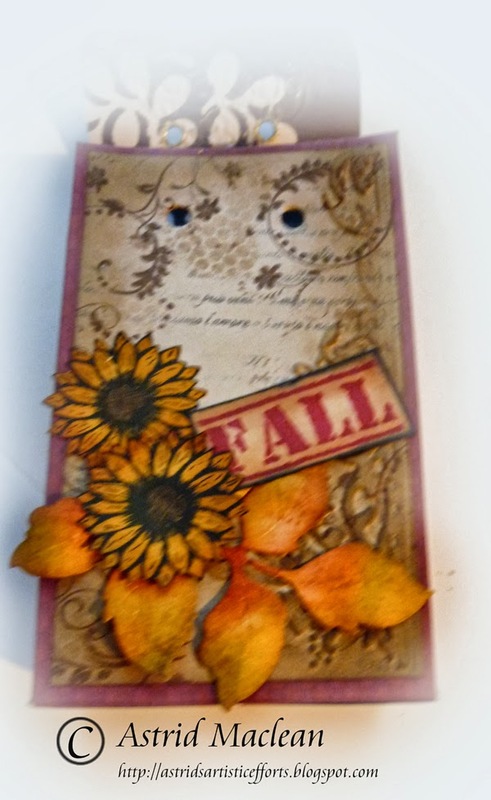 Now for the fun of decorating the front and back panels: Stamp Pumpkin and two of the smaller sunflowers from Pam Bray's Fall Colection as well as your chosen sentiments from the same set in Jet Black Archival and Red Geranium, colour with Distress Inks and mount onto the panels as shown. 11. Close the flap and tie a bow and that is it. Well, there you have it. 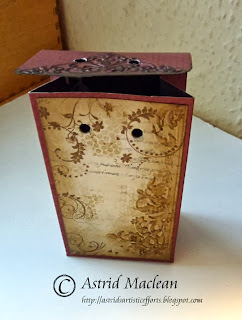 Hope you like my little project, - thank you so much for visiting and do come back on Friday when one of my teamies will be showing you another cool project. 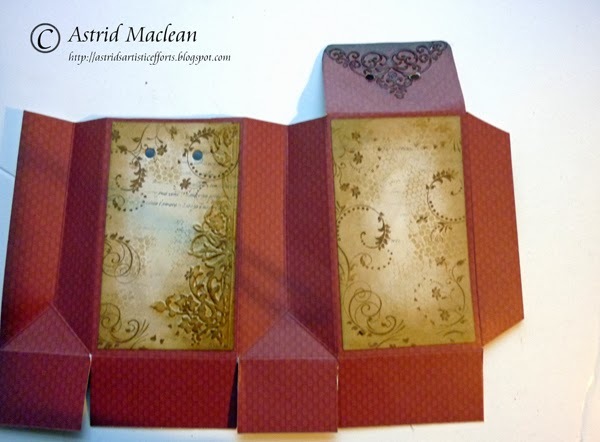 This is fantastic, Astrid! 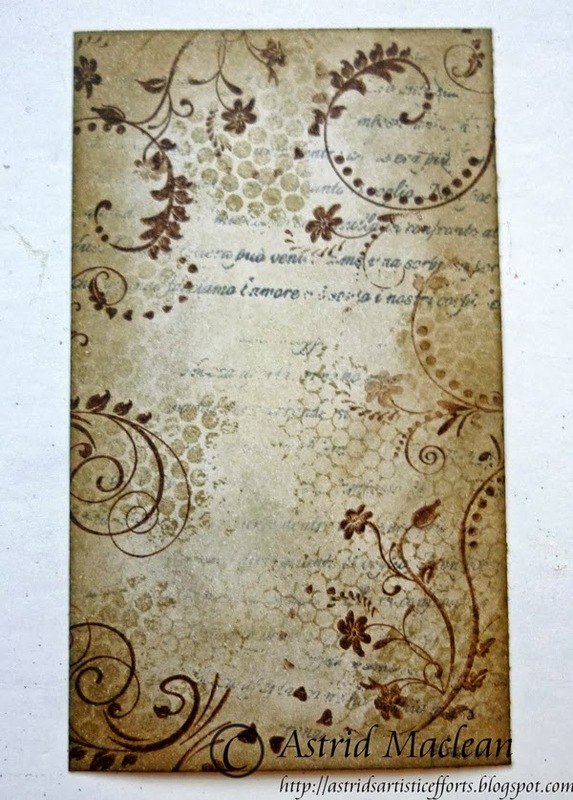 I love the paper you chose and the stamps you used. The tutorial is great, thank you! I know I'll use it for Christmas gift bags for people I work with. 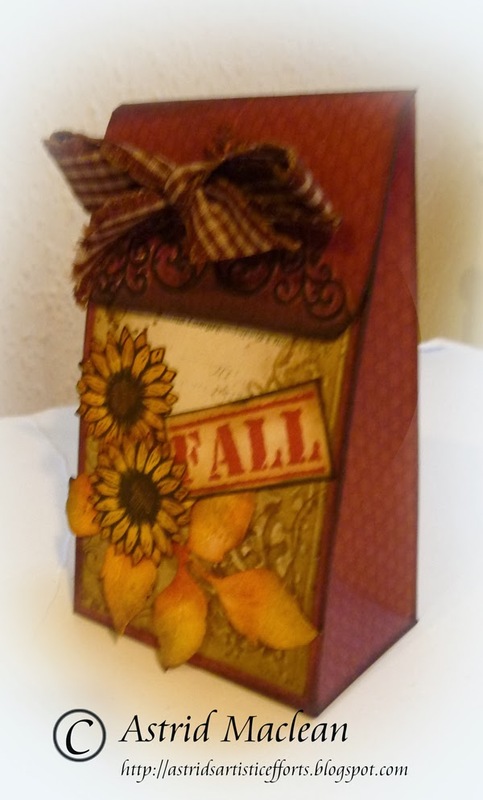 Stunning Autumn gift bag! Love the design and the tutorial is such a great share with us! Love this! Such a gorgeous bag especially as you created it from scratch and didn't merely alter a bag (me being lazy that is the option I take LOL). That bow is a lovely way to embellish it. Wow, you even made the bag too! It's really lovely. Astrid, you are really doing things from the bottom- how fantastic, a project,- I so admire all the effort you do to make art without shortcuts !! 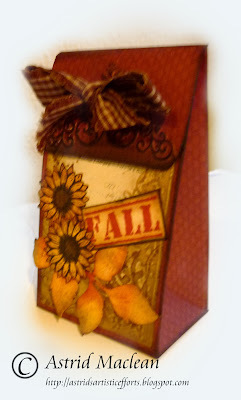 And the result is the sweetest gift bag in autumn`s rich colours!! fantastic step by step and a great project. 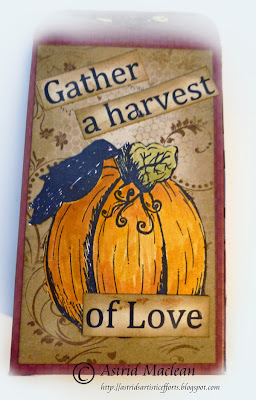 it makes me want to make one now. and i man NOW... lol. 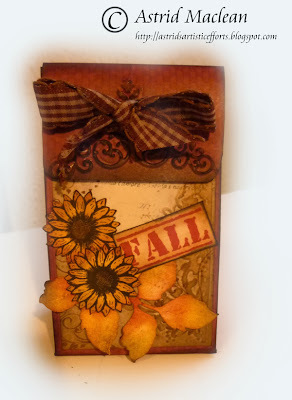 OMG, I love your Fall treat bag. Wonderful use of stamping for the background, as well as the front embellishments. Great tutorial! 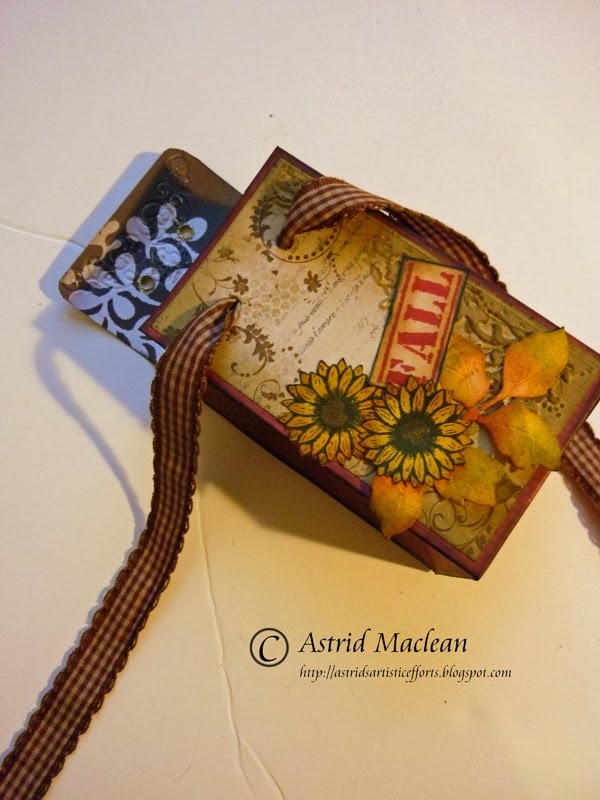 Absolutely beautiful creation, Astrid - showing off those gorgeous stamps to perfection! Thanks so much for all those how-to details too.